What are the effects of fiscal policy at the zero lower bound? R. Anton Braun, Lena Boneva & Yuichiro Waki. Does fiscal policy have large and qualitatively different effects when the nominal interest rate is zero? An emerging consensus in the New Keynesian literature is that supply-side fiscal stimulus is ineffective at the zero lower bound (ZLB) while demand-side fiscal stimulus is a useful tool to escape a liquidity trap. But new evidence provided in our paper suggests that supply-side fiscal policies can play an important role at the ZLB while the effects of demand-side stimulus may be weaker than previously found. Previous work has documented that a labour tax cut lowers employment in the New Keynesian model at the ZLB (Eggertsson, 2011) and that the government spending multiplier can be very large (Christiano, Eichenbaum, and Rebelo, 2011). These results have sharp implications for the conduct of fiscal policy in low interest rate environments. If supply-side stimulus is contractionary and demand-side fiscal policies are particularly potent then governments should rely exclusively on demand-side stimulus when the central bank’s actions are constrained by the ZLB and unconventional policies such as, for example, quantitative easing and forward guidance are not available. In this post, we first document that supply-side fiscal stimulus may be expansionary at the ZLB. This is done by considering a cut in the labour tax rate. Second, we revisit the magnitude of the government spending multiplier at the ZLB to document that demand-side fiscal stimulus can be much weaker than previously thought. This result is consistent with empirical evidence provided in Ramey and Zubairy (2014). Our analysis is based on a stochastic New Keynesian model that honours the ZLB on the nominal interest rate. When the ZLB is binding, employment and inflation are determined by a forward-looking IS curve (aggregate demand) and a New Keynesian Phillips curve (aggregate supply). During normal times, the central bank sets the policy rate according to a Taylor rule. To account for nonlinearities in the equilibrium schedules, the model is solved using global methods. We consider an environment where in period zero, negative shocks to demand and technology drive the economy to the ZLB. Thereafter, the economy returns to its deterministic steady state where the policy rate is positive with a constant probability 1-p. Once liftoff from the ZLB has occurred, the economy will remain at the steady state forever more. Some merits of this tractable approach are that we can provide a graphical representation of the equilibrium dynamics, an analytical characterization of the model’s key properties and an easy and accurate strategy for computing all equilibria. Finally, all parameterizations of our model are empirically relevant in the sense that we choose the size of the demand and technology shocks to reproduce the declines in output (7 per cent) and inflation (1 percentage point) observed during the U.S. Great Recession. Can supply-side stimulus be effective at the ZLB? A popular example of supply-side stimulus is a labour tax cut. Figure 1 reports the sign and magnitude of the labour tax multiplier – a percentage change in employment when the labour tax increases by 1 percentage point – for alternative values of p (the probability of remaining at the ZLB) and σ (the inverse of the elasticity of intertemporal substitution). There are two disjoint regions where employment increases in response to a labour tax cut. 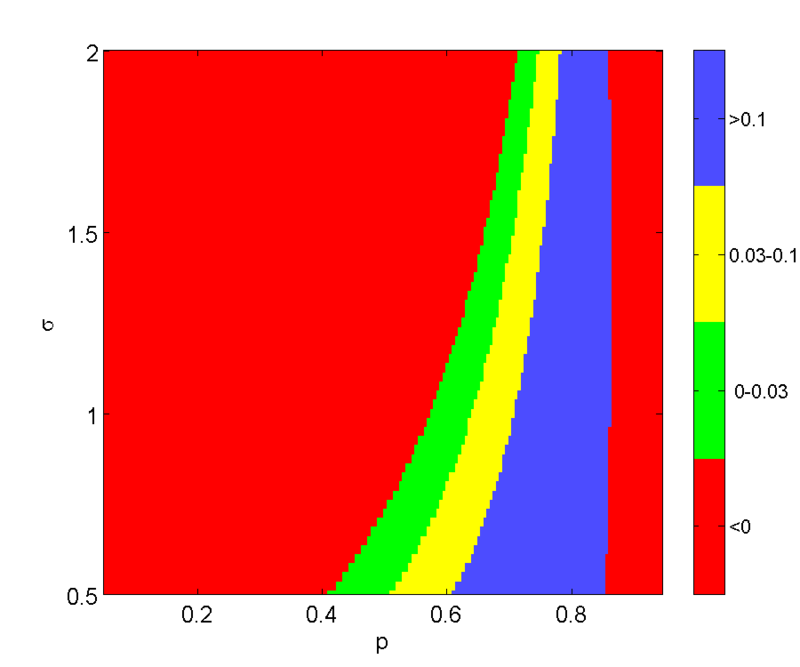 These regions are observed if the probability to remain at the ZLB in the next period (p) is either small or large. Compared to the regions where labour tax cuts are expansionary (shown in red), the regions where they are contractionary (green, yellow and blue) is small in particular for large values of σ. Notes: p is probability of remaining at the ZLB and σ is the inverse of the elasticity of intertemporal substitution. For each parameterisation, the shocks (to demand and technology) are chosen to reproduce the inflation and GDP targets from the U.S. Great Recession. The targeted equilibrium is reported in situations where there are multiple zero bound equilibria. We next examine the magnitude of the government spending multiplier at the ZLB to illustrate that demand-side fiscal stimulus may be less effective than previously found. Figure 2 reports the government spending multiplier – defined as the change in GDP divided by the change in government spending – for a wide range of empirically relevant parameterizations. 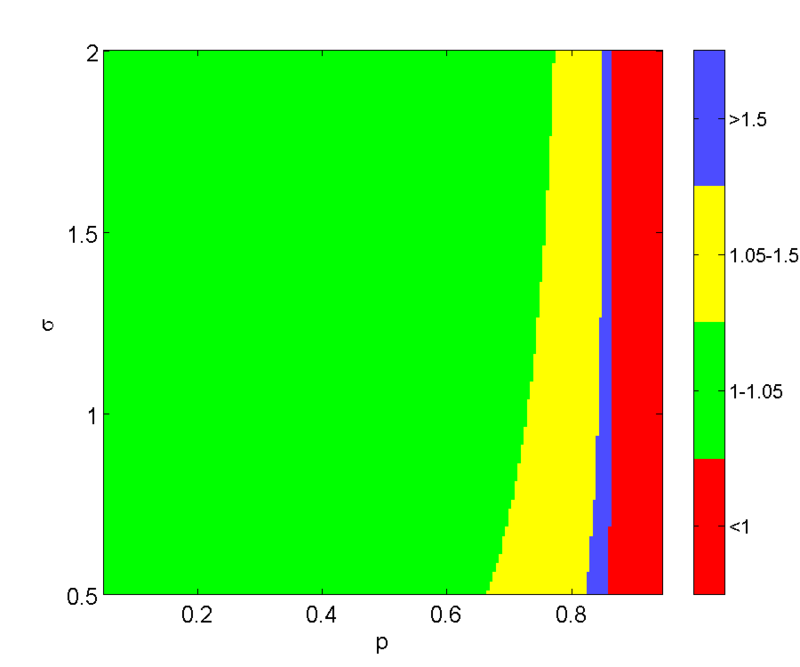 The government spending multiplier is close to one and sometimes is even less than one for values of p that are less than 0.7 or larger than 0.9 (shown in green and red). In contrast, the region where the government purchase multiplier exceeds 1.5 is small (blue). Our analysis does not rule out the possibility of very large fiscal multipliers. Figures 1 and 2 illustrate that fiscal multipliers can be large for values of p that are close to 0.86 or an expected duration of zero interest rates between 5 and 7 quarters. Intuitively, this happens when the aggregate demand and aggregate supply schedules are nearly parallel (see also Woodford (2011) and Carlstrom, Fuerst, and Paustian (2012)). Why are our results so different? Why are the results presented here different from previous findings? The result that supply-side fiscal stimulus may be expansionary can be attributed to using a global solution method that takes into account nonlinearities in the equilibrium conditions. In contrast, previous results are based on a solution method that models the nonlinearity induced by the zero bound on the nominal interest rate but log-linearizes the other equilibrium conditions about a zero inflation steady-state. A comparison of log-linear and nonlinear solutions reveals that the log-linear solution sometimes incorrectly predicts that supply side stimulus is contractionary when in fact it is expansionary. Additionally, there can be multiple ZLB equilibria in the nonlinear solution while in the log-linear solution, the ZLB equilibrium is unique. Another reason why our findings are so different is the parameterization of the model. It turns out that the effects of demand-side fiscal stimulus are quantitatively small when using empirically plausible parameterizations that can reproduce the declines in output (7 per cent) and inflation (1 percentage point) observed during the U.S. Great Recession. When this is done, small government spending multipliers of about one or less are commonplace. Previous work has made a case against supply-side stimulus at the ZLB (Eggertsson, 2011) and argued that demand-side stimulus is particularly effective in stabilizing the economy when the nominal interest rate is zero (Christiano, Eichenbaum, and Rebelo, 2011). Our nonlinear results indicate that the NK model exhibits these properties for a relatively small set of parameters and shocks. In other regions of the parameter space, supply-side fiscal stimulus stimulates the economy at the ZLB and the effects of demand-side stimulus are weaker than previous results suggest. In particular, for a wide range of empirically relevant parameterizations of the NK model, employment increases when the labour tax is cut and the government spending multiplier is less than 1.05. R. Anton Braun works at the Federal Reserve Bank of Atlanta, Lena Boneva works in the Bank’s Conjunctural Assessments and Projections Division and Yuichiro Waki works at the University of Queensland. Previous Post The danger zone – when should we worry about how much households spend on their mortgages? Next Post Modelling banking sector shocks and unconventional policy: new wine in old bottles?